With Halloween just around the corner, we here at EliteDresses.com have put together a number of great costume ideas for you. 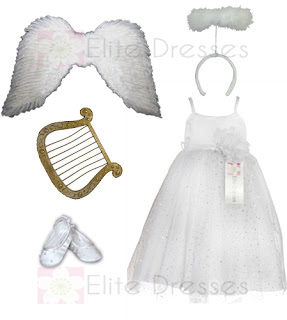 Here are a few ideas we are sure your daughter would love. Using the marker, draw a simple wing shape on the card board, remember, it doesn’t have to be perfect. Fold the coffee filters or white paper plates in half and glue them to the wings to resemble feathers (use hot the hot glue gun to secure the feathers), be sure that the round edges is pointing down. Use the Glitter finishing spray to give the wings a shiny look. Now take some white and make a circle for the halo and use more pipe cleaners to connect the halo to the wings. Use the glue gun to secure the halo. 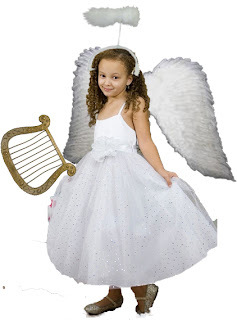 Now you have a lovely angel costume for your daughter. And the best part, you can use the dress again after Halloween. Next blog we'll have a very sweet idea for you.